Since forming in early 2009, Milton Keynes' Lecarla have played shows with The Blackout, We Are The Ocean, Go:Audio, Attack! Attack!, All Forgotten, as well many other established British bands. More recently the five-piece released a new EP, 'Silent City' and made a video for 'DILLIGAF', which was directed by Lawrence Hardy (You Me At Six, Enter Shikari, Young Guns). 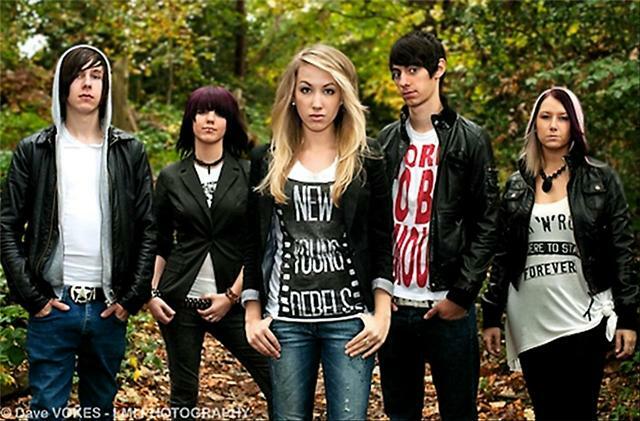 Lecarla is made up of lead singer Lizzy Dent, rhythm guitarist Hannah Whitmarsh, lead guitarist Joe Alfano, bassist Nikki Brightman and drummer Steve North. The band talked to Alter The Press about the new EP, influences, filming the video and their future plans. Alter The Press: You guys formed early last year. So you're a fairly new line-up. How did you all find each other? Lecarla: Well Lizzy, Hannah and Nikki were in a previous band together which split up, so wanted form a new one needing a drummer and guitarist. That's when they found Joe on a musicians wanted site and Steve through auditions and the rest is history. ATP: Why did you name your new EP 'Silent City'? What exactly is that reference to? Lecarla: Naming the EP seemed to take a very long time. All of us kept throwing out random names and words to try and come up with something, but nothing stuck. But then we thought of 'Concrete City' at first (based on Milton Keynes) but didn't quite have a ring to it, so we changed it to 'Silent City', which we all felt fitted in much better with out artwork and style of the CD. ATP: What are some of your influences? How would you describe your sound? Lecarla: We all individually take influences from a wide range of artists from Fightstar to Alexisonfire to even Sub Focus. The girls take influence from Hayley Williams, as of course she has become a huge success with Paramore, and is considered a great female rock icon, but by no means to we compare our music to Paramore. We'd say that our music is a mix of all different areas of rock/pop/punk/metal, creating a sound of awesomeness! ATP: Being in a band with three females and two males are there ever any conflicts, in regards to touring? Lecarla: While on the road, usually there are fights over using straightners (usually the boys!) and issues with bathrooms, showering etc. We all get our hair sorted in the end. But there is no real conflicts because we all get along so well. It's always a laugh. ATP: How does Lecarla prepare for a show? Any rituals or special things members do? Lecarla: Lizzy and Nikki always do vocal warm-ups in the girls toilets for some reason, doing sirens and freaking out the other people in the cubicles. Joe, without fail, ends up having to go to the toilet just before going on stage. ATP: What was the 'DILLIGAF' video shoot like? Lecarla: It was so amazing, but so tiring. The next day all our muscles ached. Felt like we'd done about 20 gigs in one day. Also the warehouse we shot it in, was freezing so that didn't help either. But the outcome was spot on. We love it. ATP: What are your future plans? Lecarla: The future for Lecarla is looking to be very exciting. We'll be tour hopefully around October/November time. We seem to be getting more and more exposure in front of the right people and its only a matter of time before we'll be blasting in everyone's ears. 'Silent City' by Lecarla is available now. Lecarla on MySpace, Facebook and Twitter.